While Samsung might be the world’s first company to unveil a HD screen for smartphones, HTC could be the world’s first to have those screens incorporated in a smartphone. 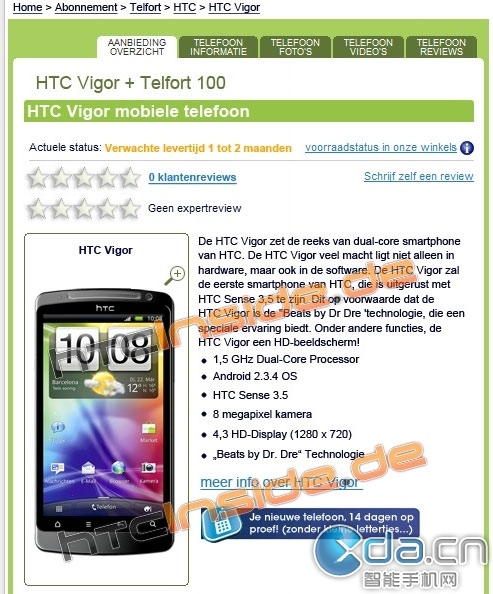 HTC Vigor is an Android smartphone rumored to release ‘soon’ and it comes packing with some pretty serious specs, the crown jewel of it being its HD screen running at a native resolution of 1280×720. The rest of the specs sheet carries some pretty heavy numbers too. Vigor will also come packing with a 1.5GHz dual core CPU which, just like its screen, could be the world’s first. Sense UI running on Android 2.3.4 has gotten a bump to version 3.5 although no detail yet as to what new it brings. The phone will also carry the Beats by Dr. Dre branding, so expect some quality music with hopefully some new audio processing hardware and better stock earphones. The phone will also carry a 8MP camera. There hasn’t been any official announcement yet nor any expected release date so the phone is still in rumor land.